Prepare for a fun trip back in time, because we are taking you to ancient Greece, where you will be spending time in the Greek Temple, looking to land the Medusa, Minotaur, the Nemean Lion and the Eagle of Zeus. 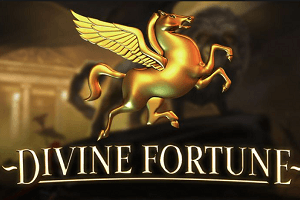 This is not the story about Hercules who is performing his 12 labors, this is Divine Fortune, a five-reel, 20-payline video slot, which was NetEnt’s first release in 2017. Spinners will benefit from a range of additional features, including Falling Wilds Re-spins, expanding Wilds, Wild on Wild feature, Free Spins and the Jackpot Bonus, which offers three different jackpots. The reels of the 2017 release are placed in an ancient Greek Temple and here you will come across some of the most famous creatures from the Greek mythology. There is the Medusa, which can turn you into stone, the Nemean Lion, which cannot be killed by weapons made by mortals, the Minotaur who can lead you in his labyrinth and the Eagle of Zeus, the personal messenger of the most important deity from Greek folklore. The Pegasus is used as a Wild that substitutes for all regular symbols, while Zeus Lightning is the Scatter that triggers free spins. The Coin is the Scatter that triggers the Jackpot Bonus Game. Standard playing cards are used for low-paying symbols. There is nothing complicated when it comes to the rules of the game, because gameplay is very similar to other standard NetEnt titles. 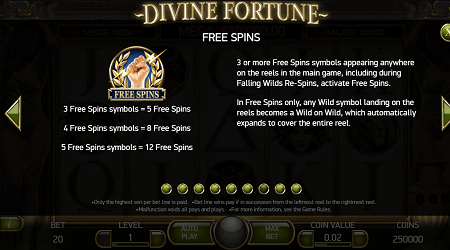 The Divine Fortune video slot features five reels, three rows and benefits from 20 fixed paylines, which pay left to right, beginning from the far left reel. To start winning payouts, gamers need to land at least three matching symbols on a payline, it’s as simple as that. Set the coin denomination (£0.01 – £0.50) and the bet level (1-10) and bet from £0.20 to £100 per single spin. Land the Pegasus Wild on the reels to trigger the Falling Wilds Re-Spins feature. The Wild will move one cell down while a re-spin is performed. If new Wilds appear during re-spins, the feature will continue and if a Wild lands under another Wild it will activate the Wild on Wild feature and expand the Wild to cover the entire reel. The Free Spins feature is triggered when three or more Scatters appear on the reels. Gamers can trigger 5, 8 or 12 free spins, depending on the number of Scatters landed. The Falling Wilds Re-spins feature is also active during freebies, while the Wild on Wild feature will be activated each time a Wild lands on the reels, turning all Wilds into expanding Wilds. Last but not the least is the Jackpot Bonus Game, triggered by three Coin Scatters. These Scatters have to appear in the same spin in order to trigger the feature. For every Coin landed, gamers get 100-200 times the bet, and then spinners will start matching coins on the screen. Match one, two or three rows of coins to get a Minor, Major or the Mega Progressive Jackpot. There are plenty of opportunities to land massive wins in the NetEnt title. First, there are three different jackpots spinners can win, one of the being the progressive jackpot. The Free Spins feature can also be very generous, thanks to expanding Wilds. The Medusa is the symbol that pays the most, offering 600 coins for five of a kind. Divine Fortune’s RTP is 96.59%. The NetEnt title is playable across all devices, so you can enjoy the 2017 release on your desktops, laptops, mobile phones, tablets and other compatible devices. The quality of the game is excellent, so the gaming experience is completely the same on any device. 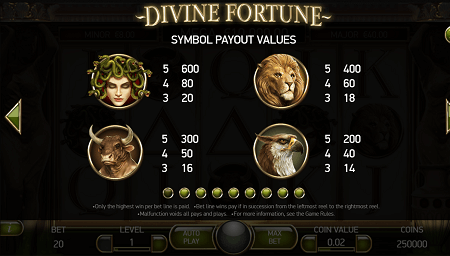 The Divine Fortune video slot is simply excellent. Outstanding visuals, matching soundtrack and features that are both entertaining and rewarding. Everything gamers love is neatly packed in a five-reel slot with 20 fixed paylines. Our personal favourite is the Free Spins feature with Falling Wilds Re-spins and expanding Wilds, because this is where you can pocket some serious cash. Also, there are three jackpots on the offer and the Mega Progressive Jackpot can be extremely generous. Enjoy your time in this ancient Greek temple. Play Divine Fortune slot at Genesis Casino!